PREVENTS COLOUR RUNS TO YOUR FABRIC AND ALLOWS MIXED WASHES. Every time you wash bright clours or dark coloured clothes, traces of dye bleed into your laundry. These dyes build up over time to gie your clothes a dull, grubby appearance. 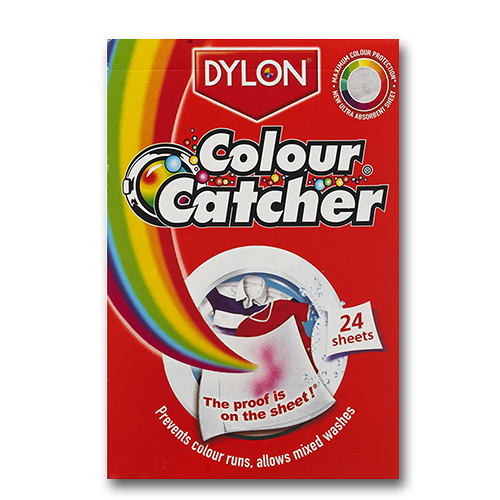 Colour Catcher is a revolutionary sheet that prevents colour runs, allowing mixed colour washes. Wash with cofidence every time with maximum colour protection. Each anti-transfer sheet is treated with special ingredients that act like a magnet protecting your clothes by trapping loose dye and dirt during the wash. Available in 12 and 24 sheets.